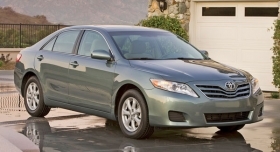 The Toyota Camry rules the mid-sized car segment, but purchase consideration is falling. Here are the percentages of Edmunds.com shoppers for mid-sized sedans who configured the Camry and the Ford Fusion. LOS ANGELES -- Toyota is spending a ton of money to nail down this year's U.S. brand sales race, but No. 2 Ford has seized the momentum. So while Toyota is a sure thing in 2009, there's no guarantee about which brand will be on top in 2010. Toyota is putting the finishing touches on a triumphant decade -- nearly doubling market share to 14.3 percent since 1999 and rising from fourth place to first. But a resurgent Ford is applying pressure, both in sales volume and all-important purchase consideration by probable buyers as measured by independent market research firms. Compete Inc., a Massachusetts research firm that studies online car shopping, says Ford has surpassed Toyota in customer consideration for the first time since it began tracking such data in 2002. "That's huge," says Lincoln Merrihew, Compete's automotive director. "Toyota is still strong, but Ford is breaking away, gradually gaining more share of market and getting more shoppers." Ford was the top-selling U.S. brand for 19 out of 20 years -- until 2007, when Chevrolet grabbed the No. 1 spot, and Ford slipped to third. Toyota won for the first time in 2008 as Chevy dropped to second. As part of its push to finish No. 1, Toyota launched its annual Toyotathon winter sale on Nov. 16, about two weeks earlier than usual. The estimated $500 to $600 million campaign, which includes national and regional advertising and incentives, all but assures Toyota will be No. 1 for the second straight year. But Ford is making up ground in more ways than one. Although Toyota has outsold its rival this year by 58,249 units through November, Ford has cut sharply into the lead. After the first 11 months of 2008, Toyota led Ford, which then was in third place, by 164,334 units. Also important for the future: Ford is closing the gap on quality. "Ford has pretty much caught Toyota in quality, but it hasn't translated into customer perception yet," says Dave Sargent, vice president of automotive research for J.D. Power and Associates. "The big challenge for Toyota is that as quality gets closer, what is their differentiator? Toyota can't rely on that quality gap anymore to see them through." Toyota is digging into its deep pockets. Not only did Toyotathon start early; dealers say it is the biggest winter sales event they have seen. "Toyota is spending money like crazy to get the message out," says Mark Mason, who owns Ford and Toyota stores in Lugoff, S.C.
Deals range from 0 percent financing to cut-rate lease offers that include the brand's two best-sellers, the Camry and Corolla. And Toyota Financial Services is buying deep, extending the deals down to the Tier 3 credit level scores of 650. "Being No. 1 is so overblown," shrugs Toyota General Manager Bob Carter. "Do I want to sell a lot of cars? Absolutely. I have a lot of respect for Ford, but we're focused on what we do best, and that's the retail side of the market. "We have terrific leases," he added. "That's a huge opportunity for us because just about everyone but Honda and Toyota has abandoned leasing." But analysts and dealers say Ford is benefiting from better quality, an improved lineup and a halo effect because it did not take government bailout money. Edmunds.com says that for the Ford Fusion, "purchase intent" -- when a shopper on its site takes time to configure a vehicle online -- rose from 3.5 percent of mid-sized car shoppers to 6.7 percent from October 2008 to October 2009. Purchase intent for the segment-leading Camry slipped from 15.7 percent to 13.2 percent over the same period. The Fusion is catching up in raw sales numbers, too. The Camry outsold the Fusion by about 275,000 units in 2008 but will win by only about 160,000 units this year. "Intent is the best measure we have of the likelihood of purchase," says Stephen Berkov, director of client strategy at Edmunds.com. He says fewer customers are automatically turning to Toyota than in the past. "More people are considering what the brands mean to them," Berkov says. "Now you just can't say your brand name and expect people to want you." Compete, which tracks all major online car-shopping sites, says the Ford brand pulled even with No. 1 Toyota in customer consideration in January, each with 20 percent consideration. Ford fell back a bit, then caught up with Toyota again in May and pulled ahead in August, with its highest consideration rate ever: 22.4 percent compared to 22.3 percent for Toyota. Compete has not compiled industrywide consideration numbers for September and October. But Merrihew said Ford had 8 percent more shoppers than Toyota in September and 14 percent more in October. Compete likewise defines consideration as shoppers who take the trouble to configure vehicles online. One example of the inroads Ford has made on Toyota: Toyota's Camry, shown, outsold Ford's Fusion by about 275,000 units last year. This year, that margin will be about 160,000. A string of messy recalls this year adds to the pressure on Toyota. Going forward, Merrihew says, "no way can the bad press help Toyota. Nothing can be positive about that." Toyota received a black eye this fall when it announced it would recall 3.8 million of its Toyota and Lexus models to fix pedals and replace floor mats that could cause unintended acceleration in the cars. It also is recalling Tundra pickups for rusted frames, and the National Highway Traffic Safety Administration is investigating complaints of engine stalls in 2006 Corolla and Matrix models. "Does it affect business? That's hard to tell," Carter says. "We had a very good November, our highest market share ever for a November" (15 percent). He says the pedal fix will begin in January. "We're working 24/7 on it," Carter says. "There is a lot of confusion out there. I'm confident we will turn this into an opportunity that shows we stand behind the customer." A consumer study by Automotive Lease Guide conducted before the recent Toyota recalls, shows Toyota and Honda continue to top the list when it comes to perceived quality. On a scale of 1 to 100, consumers rated Toyota at 85, while Ford trucks got 65 and Ford cars a little more than 60. But both Ford cars and trucks were up 10 points from the previous year, the biggest gains among the brands studied. "A lot of it has to do with Ford being the only domestic that didn't get the bailout money," says Matt Traylen, the guide's chief economist. "It also has a lot of good new product."